If asked "what is your favorite Disney property to stay at", I would think it is the same as being asked to pick a favorite child. They're all unique in their on way. Over the past 3 years, I have stayed at nearly every resort at Walt Disney World in Orlando. I am going to take time to do a few reviews on them. Up first, the popular Disney’s BoardWalk Inn. This was the very first resort I ever stayed in as an adult, back in 2004. 13 years ago, I was not the same Disney fan as I am today but I remember being in awe of the property. It's fun going back many years later and having a true appreciation of the property and the fun quirks within. The very first thing you will see upon walking in the front doors is the Hippocampus Electrolier hanging from above. If you aren't familiar, a hippocampus is a creature from Greek mythology that is part horse, part fish. Of all the many times I've seen this chandelier, I've never noticed the horses were part fish! 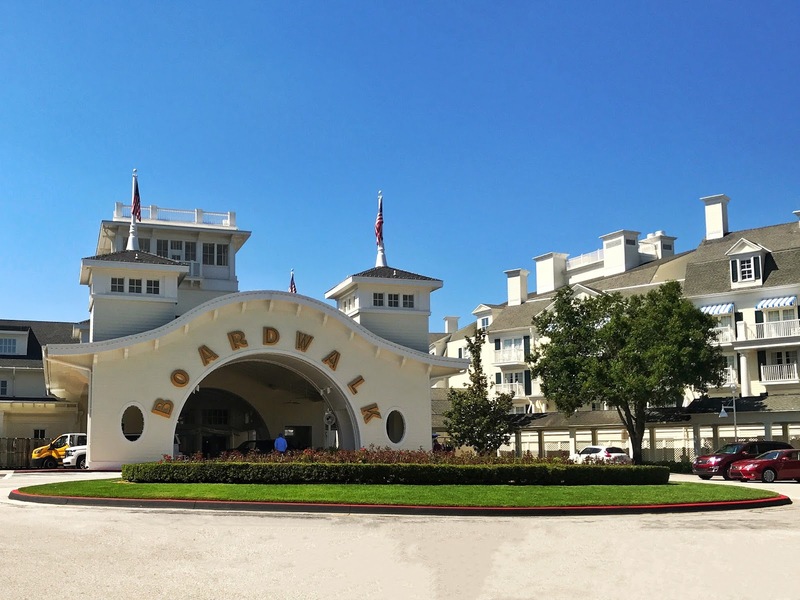 Disney’s BoardWalk Inn has 372 rooms and Disney’s BoardWalk Villas has 280 units. The property is located alongside Crescent Lake, which backs into Epcot. It is the perfect place to stay if you want an easy walk to Epcot or Disney's Hollywood Studios (they have boat transportation as well). Along Crescent Lake, you will find a ton of things to do if you want a break from the parks. Disney's BoardWalk is like stepping back in time. All of a sudden, you find yourself sitting in Atlantic City circa 1930 with an abundance of seaboard charm. The miniature carousel above is BoardWalk's version of a Grandfather clock. It goes off every hour, and revolves. The attention to detail is incredible. Speaking of carousels, the ever so creepy Nanny Chairs below were for those who didn't want to ride. I don't think you could pay me to sit on one of those chairs! The grand lawn was recently redone with turf! I people watched for about 10 minutes and nearly every person touched the grass. It looked so real but so perfect that you had to touch it! Disney’s BoardWalk has 9,000 SF of retail shopping including one of my favorite art shops on property, Wyland Galleries. There are also a ton of restaurants and entertainment include Flying Fish Café, Trattoria al Forno, AbracadaBar, Big River Grille and Brewing Works, ESPN Club, Atlantic Dance nightclub, Jellyrolls dueling piano bar and Ample Hills Creamery (ask for a sample!). Disney's BoardWalk is one of the locations on property who rent Surrey Bikes. There are two, four and six people bikes that start at $25. One day, I will rent one of these while on property! Guests staying on property can take advantage of the children’s activity center, health club (which is about to receive a huge makeover), tennis courts, and the infamous Luna Park, an enormous free-form pool area with a 200-foot water slide in the form of a classic wooden roller coaster. On my most recent trip, I had the opportunity to stay in Disney’s BoardWalk Villas which is part of Disney Vacation Club. The Villas are available in studios and one, two, and three bedroom units. We stayed in a one bedroom villa which had a King sized bed, a living room with a pullout sleeper sofa and a bathroom that had two entrances, perfect if you are entertaining and don't want your guests to see the bedroom. Speaking of bathrooms, let's chat about this jacuzzi garden tub real quick! There was a flat screen TV in both the bathroom and the living room. The living room kept with the BoardWalk decor. It was very spacious and had plenty of seating. All of the units offer kitchens, living areas and a variety of amenities. Having a full-sized kitchen was a huge perk. If you are staying at the BoardWalk Villas, you can take advantage of Disney grocery services. Instead of having a balcony, we had a patio which was very large. If you go for run, you can easily access your room without going through the main resort (if you have someone in there still of course). The view from our one bedroom overlooked the bridge which brings people from the lake to Hollywood Studios. I also had the opportunity to check out a standard room in Disney BoardWalk Inn. This room had two queen beds and kept up with the BoardWalk decor. I loved the artwork in this room! Overall, I absolutely loved staying at Disney's BoardWalk. The location is perfect in my mind, being able to walk to Epcot, Hollywood Studios and of course all the amenities that the BoardWalk offers. The restaurants at the BoardWalk do not disappoint and the entertainment will not leave you board. Just be prepared for Jelly Rolls....it is very possible have a little too much fun there.